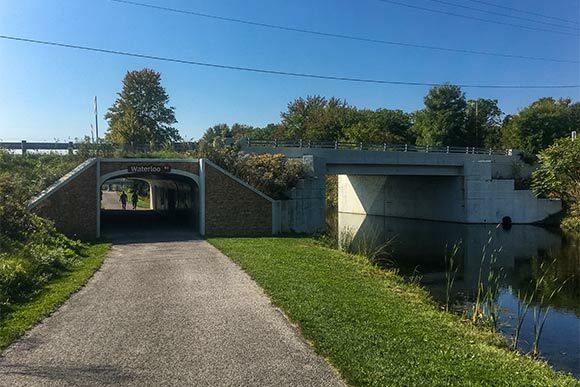 The transformation from a series of ambling walks southward to a concerted effort to trek the entire 100-plus miles of the Ohio & Erie Canalway Towpath Trail happened sometime in 2014. 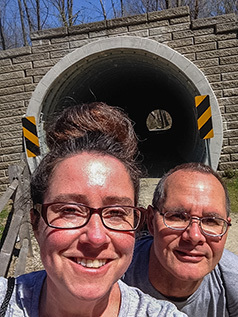 My husband and I had walked several sections of the trail around Northeast Ohio over the years, but something bit us that year after we'd done a few consecutive chunks that took us through to Peninsula. It became apparent that we would continue, one or two trailheads at a time, until we got all the way to New Philadelphia in Tuscarawas County. 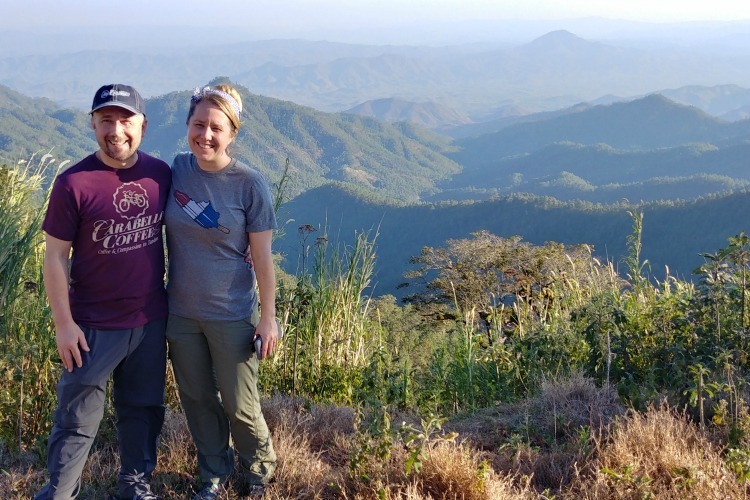 Erin O'Brien and husband Eric Nowjack take a selfie break in Stark CountyThe odyssey that unfurled over the next two years surprised and astonished us. We were Alice and the White Rabbit tumbling through Wonderland, Dorothy and the Scarecrow following the Yellow Brick Road. The trail offered up everything from the magical to the mundane. At the conclusion of each trip, lunch was our humble reward: Barberton chicken, steaming bowls of homemade chili and plates of sauerkraut balls served by local wizards and queens of hearts. It was glorious. Not surprisingly, countless bicycles whizzed by us, and while I wholly respect that mode of transportation, the cyclists didn't get the same Towpath we did. When you walk these miles – which we did twice: en route to the destination du jour and then back to the car – you not only glean the details, you have renewed respect for the local farm hands, rough-housers and transients who dug this venerable ditch by hand. In exchange for their sweat equity, they were paid a handful of coins and a slug or two of whiskey. A disclaimer: Our Towpath walks were mini vacations during which I eschewed the meticulous documentation my craft ordinarily demands. Therefore, you will find this accounting to be a bit unvarnished. This is no travel guide, but instead an overarching recap brimming with details in places and a bit fuzzy in others. At its core, the Towpath is one of the first public infrastructure efforts, and the right-of-ways the project established nearly 200 years ago continue to serve all of us. Railways snake along the trail's length. Power transmission lines loom overhead. Hikers and bikers will also amass more olfactory experience with the Akron wastewater treatment process and the Northeast Ohio Regional Sewer District than they ever imagined. Behold the magnificence of the bridges as you walk under them, over them and next to their graceful arches and steel I-beams. You'll turn into a blinking 10-year-old when a locomotive breaks onto the scene upon the 100-year-old CSX Short Line railroad bridge adjacent to the Canalway Center on East 49th Street in Cuyahoga Heights. The bridge is 13 stories above a beaver pond wherein tree trunks end in perfect points courtesy of industrious teeth. Standing beneath the 212-foot-tall Valley View bridge imparts a true appreciation of its size and offers a specific point on the trail that is at once subtle and symbolic. Above your head are 50 million pounds of steel while the path beneath your feet was trampled into submission by the hooves of mules some two centuries ago. And everyday traffic trudges next to you on the utilitarian surface of Canal Road. The people are off to office jobs on Rockside Road or to take in a movie at the Cinemark. A dozen hot wings at Quaker Steak and Lube? Just down the street. The tunnels never get old. Whenever we stepped into one, I wholly expected it to start slowly spinning like a funhouse oddity. Of course they never did, but my balance listed just the same as I traversed them. 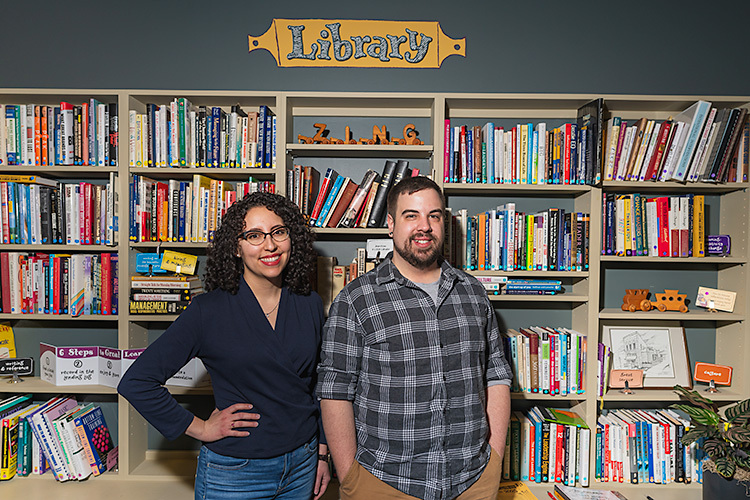 Two that stood out include one in Steelyard Commons that separates that strange collection of retail and history from the rest of the city and another north of Lock 29 in Peninsula that suddenly appears amid the dense greenery like a magician's trick. 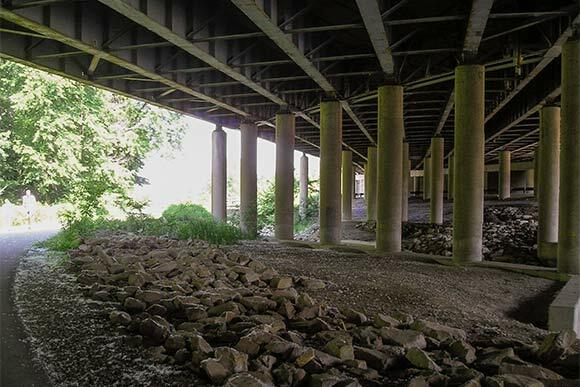 Underpasses – and there are too many to even begin to count – are another we're-not-in-Kansas-anymore experience. Each one is an open-ended cave thrumming with sounds that range from unearthly dull echoes of the county road traffic above to the deafening screams of trucks and traffic speeding over the lanes of Interstate 77. Their interior structures are giant rib cages, each one at once similar to the next and completely unique. It all culminates to a simple revelation: Walk the Towpath and watch the dull concrete, steel and asphalt of our infrastructure come to life. The Towpath is replete with dense forest, wildlife, gorgeous vistas and waterways dappled with glittering sunlit diamonds. The summer months are emerald green. Fall is amber and gold. I loved winter and early spring best, when an abandoned bridge abutment or industrial ruin was laid bare amid the leafless trees. The Towpath also winds through towns and cities. Trekkers are occasionally obliged to navigate on-street connections, including a couple here in Cleveland around Steelyard: one along the Jennings road corridor to the trailhead by Alcoa on Harvard and another via Quigley and West 14th that takes you from the northern terminus of Steelyard to the heady Scranton Flats (a wonder in its own right). That route will give you an appreciation of the damage almighty Progress incurred upon our urban neighborhoods when it chopped them into bits to make way for road and rail. Also: residential architecture. Downtown MassillonThe urban stretch through Akron delighted me with a stop in Lock 3, glimpses of a gritty underbelly and vintage industrial structures. But it was Massillon that took my breath away. Walking the stretch of trail atop the levee between downtown and the Tuscarawas River felt like a scene from a dystopian movie. Upon it, we traversed homages to actor Lillian Gish and baseball great Tommy "Old Reliable" Henrich. An on-street connection included a park, neighborhood and the Vietnam Veterans Memorial Viaduct, which is lined with 18 plaques paying respect to as many young soldiers lost in Vietnam. As I stood before them with the roaring traffic on Route 21 beneath me, tears rolled down my cheeks. The phrase thank you for your service never rang so inadequate. The Towpath never lets you forget who we've been. There are bonus points amid the streets of Bolivar, Canal Fulton (which boasts a working canal boat) and Navarre. They have that small-town solidity along with pockets of unmistakable distress. 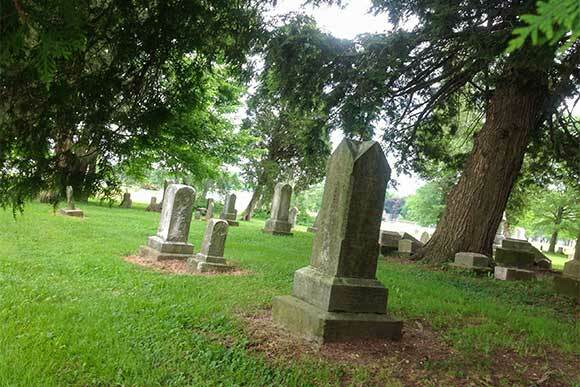 Places such as the Bolivar Cemetery and the century-old streets of Navarre - so obviously scaled for humans and horses - offer an organic perspective on history: some things don't need an historic marker. - The stretch north of Szalay's place in Peninsula is lined with acres of corn. If you happen upon it in season, you will be assaulted with continuous cannon fire. The barrage is intentional, but not meant for you. These are sound cannons, aimed at discouraging our feathered friends from helping themselves to the crop. However unnerved you are when you emerge from that would-be battlefield near Bolanz Road, you are free to check your shell shock and drop into Szalay's proper for an ear of roasted and buttered sweet corn. - On the southern end of Massillon, we came upon a massive stockpile of piping that went on for about two miles. It was positively jaw dropping in scale – so much pipe – and even more so considering the story behind it. The half-inch thick, 42-inch diameter steel piping, which is slated to carry natural gas, was all imported to Cleveland from Greece and then trucked south. - Adjacent to Wilbeth Road in Akron are the Wilbeth Wetlands. The category 2 area, which is undergoing restoration, is marked by ghostly dead trees, green water and a mostly brown riparian area. It was previously home to a collection of industrial wells owned by Firestone, which gave the land to the city in the 1980s. 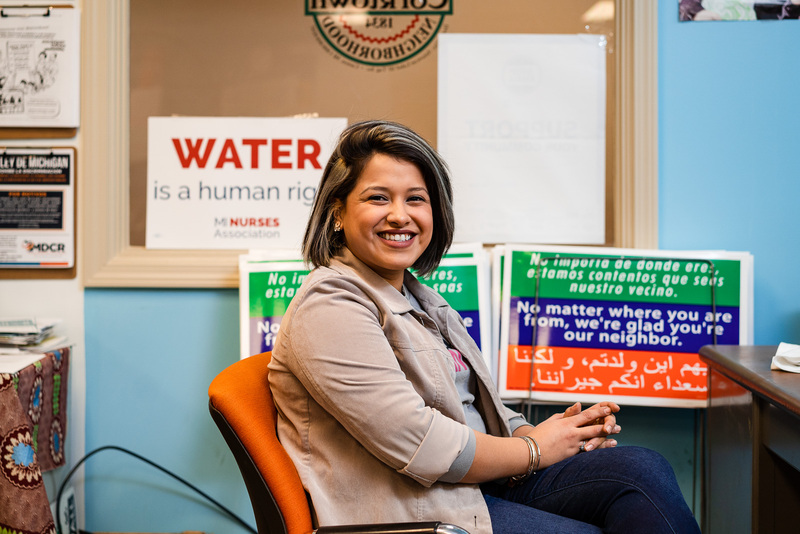 Invasive foreign plant species and decades of improper soil and water management have all contributed to the area's troubles. Walking by these acres amid the otherwise lush summer foliage is a vivid warning of the dangers of poor environmental stewardship. Wilbeth Wetlands - The Wilbeth Wetlands line the eastern side of that span of the Towpath. 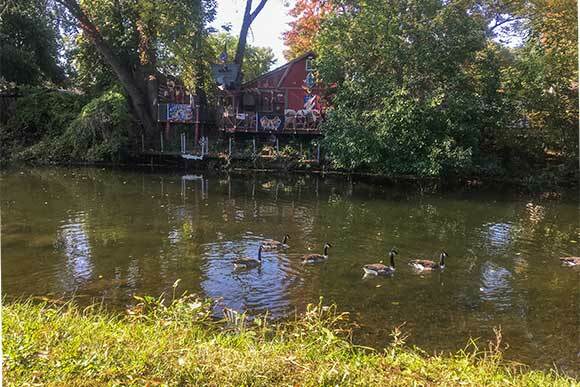 On the other side, you'll find what may have been built as summer cottages lined up along a gentle flowing channel south of Summit Lake – a perfect spot for weekend cookouts, canoeing and backyard volleyball. Now they look to be permanent residences in various states of repair as they face those distressed wetlands. - Five miles of the Towpath through Summit County are lined with barbed wire fencing festooned with signs: No Trespassing - Violators Will Be Prosecuted - PPG. Five miles – think about that. - At the Lock 29 trailhead in Peninsula we came upon three- or four-dozen people in and around the parking area. They were all seated before easels, painting. Properly rendered, the scene could have easily been a New Yorker cover. - From a distance, Summit Lake is gentle and inviting. It includes one of the more unique features on the trail: a stunning boardwalk. Unfortunately, its waters are dotted with floating debris that would make an Indian cry. Also, while we passed by one man fishing on that otherwise brilliant early fall day, the lake was absolutely devoid of any recreational vessels. - An EMT vehicle entering the Towpath via a trailhead in Stark County and racing to someone's aid gave us pause – a broken ankle is never more than one slip away and a charged cell phone is an essential safety item, particularly in the less traveled sections of trail. 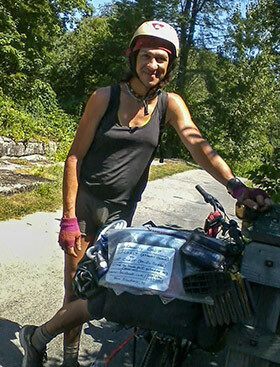 A woman celebrates life with a cross country cycling adventure.- While pausing at an overlook, we met a woman cycling Coast to Coast. The cross-country trip was a way to celebrate her ongoing gender transition. A year later, another woman passed us near Navarre. She looked to be in her 60s (if not beyond) and had a huge pack strapped to the front of her body. She did not stop, but waved and said, "Training for the Appalachian Trail." - Just north of Bolivar and the Fort Laurens State Memorial, a monumental pedestrian bridge traverses I-77, which is astonishing on account of its sturdiness and scale. After all, the majority of the trail in Tuscarawas County is earthen/gravel. - Poking around off the trail always paid off. The Eric Grohe murals in downtown Massillon are so realistic, you'll think you can walk right into them. 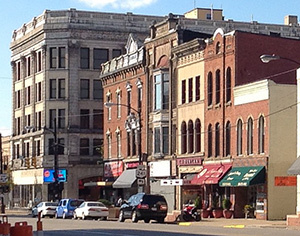 Downtown Barberton (the Magic City) is worthy of a stroll, with its vintage buildings, shops and green space. Exploring two old abandoned bridges: the Old Zoar Bridge and the Zoarville Station Fink Through-Truss Bridge were pure adventurer's candy. Happenstance played into our odyssey. While searching for lunch in Zoar, we wandered into a crowd of people and pups. (Granted, you couldn't miss the annual Dog Fest in that tiny burg.) 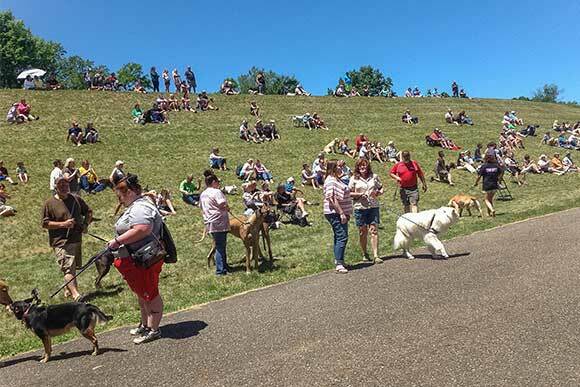 We lounged on the grassy hill of the levee and feasted on pulled pork while watching the four-footed attendees. At the urging of their masters, they would run furiously towards a large pool and dive in, Superman style. 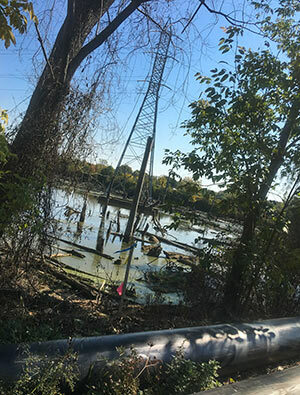 - Also: junkyards, public housing, herons and other waterfowl, strip malls, massive steel storage tanks, belching machinery, residential backyards, sunbathing turtles, rust-pocked piping, even an ancient Mini Cooper – you'll see all of it and then some upon the Towpath. You'll also feel akin to the men who dug the canal, as well as those that guided animals and boats along its length. - Lastly, there is an unremarkable portion of trail in the Cuyahoga Valley National Park by old Fitzwater Road in Valley View near the Independence border that reaches deep inside of me. This land once housed my great grandfather Doubler's farm. While my family was furious back in the late 1970's when they were forced to sell those acres via an eminent domain mandate, here in 2016, I couldn't be happier to have them preserved. The Towpath ends inauspiciously by forming a simple T with Ohio State Route 800 in New Philadelphia. When we arrived there this past September, I thought I would be inconsolable. I was not. After all, the Towpath is with us always and forever, relevant to everyone who ventures upon it. For those interested in getting started along the Towpath locally, O'Brien suggests starting at the Metroparks Canalway Center in Cuyahoga Heights and heading 2.3 miles north to the Harvard Road trailhead next to Alcoa or 3.7 miles south to the Lock 39 Trailhead on Rockside Road. Both sections feature wonderful examples of infrastructure, wildlife habitats and industrial/commercial elements. The southern section is easily split into shorter walks. 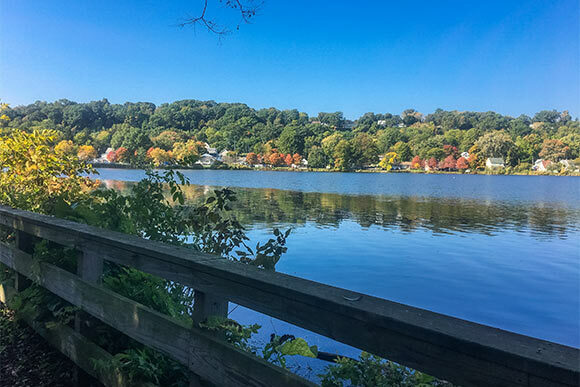 The Ohio and Erie Canalway stretches more than 100 miles between Lake Erie and New Philadelphia, through the counties of Cuyahoga, Summit, Stark and Tuscarawas. 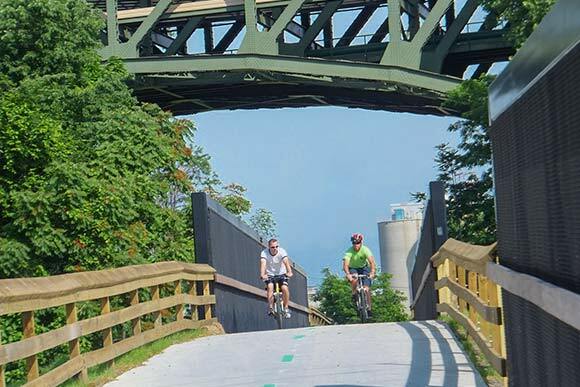 Partners include the Cuyahoga Valley National Park, the Cuyahoga Valley Scenic Railroad, the Cleveland Metroparks, the Summit Metro Parks, the Stark County Park District and the Tuscarawas County Park Department and Canalway Partners among others.